As we've noted in many reviews, many of today's NASes can be limited by the bandwidth of a single Gigabit Ethernet connection when transferring large sequential files That's why you'll see many of the file copy read and file copy performance numbers clustered around 110 Mbps. Aggregating multiple ports can increase total throughput, but usually only for multiple users accessing the same NAS via aggregated links between the NAS ans network switch. Today, the simplest way to increase throughput above 1 Gbps is to use 10 GbE. But this can be a costly proposition, since you need 10Gbe on client, switch and NAS. Still, some higher-end NASes are beginning to either offer 10GbE as an option, or build it in. Such is the case with NETGEAR's ReadyNAS RN626X that I'm reviewing today. The RN626X is a 6-bay NAS powered by an Intel Xeon server-class processor. The "X" in the product name indicates that it's a family of NASes. It's available in diskless (RN626X00), 18TB (RN626XE3 - 6X3TB), 24TB (RN626XE4 - 6X4TB), and 36TB (RN626XE6 - 6X6TB) configurations. 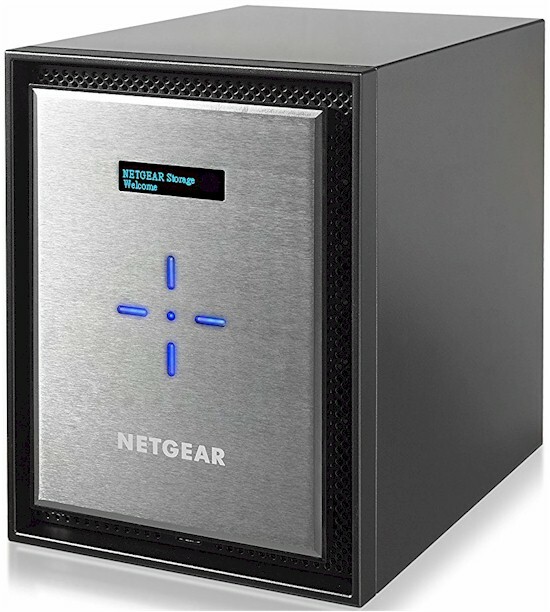 Also listed on the NETGEAR website as "coming soon" is the 12 TB RN626XE2 (6X2TB) model. Total capacity based on 10TB disks is 60TB. An expansion unit, the EDA500 can add five more bays for additional capacity. I'll be comparing the ReadyNAS 626X with the NETGEAR ReadyNAS 716X and Thecus N7770-10G NASes. All three have built-in 10 Gigabit Ethernet as well as two Gigabit Ethernet ports. Both of the ReadyNASes have two 10 GbE ports while the Thecus has only one. The chart below, generated from the NAS feature chart, shows the important part of the comparisons between the three products. Both of the ReadyNASes are six-bay NASes, the Thecus N7770-10G is a seven-bay NAS. The callouts below shows the front panel and rear panel callouts. With the drive bay door closed, you can view the LCD status screen and navigate through the menu options. With the drive bay door open, the six bays are exposed as well as a USB 3.0 port, disk indicator LEDs, and a power button. The table below summarizes the status indicators. Four Western Digital Red 1 TB (WD10EFRX) drives (SNB supplied) were used for testing. Total power consumption with all drives spun up was 55 W (drives active) and 37 W (power save). Fan and drive noise was rated low. We found the RN626X much easier to take apart than previous products. The rear panel comes off with 2 screws and the PCB is mounted on a plate and removes with four screws. The image below shows the component side of the main board. Referring back to the photo of the RN 716X board, there are similarities, but the boards are different designs. The PCI-e slot at the top of the photo has a removable rear panel to support access to connectors on an expansion card. Below is a shot of the bottom of the RN626X PCB. Note the beefy mounting bracket for the heatsink which most likely adds stability and additional heatsinking. Update - A sharp-eyed reader pointed out the M.2 slot at photo bottom left and wondered if it could be used to support a future SSD cache drive. The key components are summarized in Table 2 showing the ReadyNAS 626X, ReadyNAS 716X and Thecus N7770-10G for comparison. ReadyNAS Firmware version OS 6.6.0 was loaded onto the ReadyNAS 626X and performance tests were run using the Revision 5 NAS test process. All tests were run using Western Digital Red 1 TB (WD10EFRX) (x4 SNB supplied). As noted earlier, performance is limited not by the ability of the NAS to handle a heavy load, but rather the limit of Gigabit Ethernet and a single client. Since all three NASes in our comparison have beefy Intel processors, we expected that File Copy Read and File Copy Write throughput should have maxed out at about 108 -100 MB/s for all RAID levels. With the exception of RAID 10 File Copy Write (98.0 MB/s) on the RN626X and RAID 5 File Copy Read (96.2 MB/s) on the RN716X, all of the scores were at the top of the chart or within 5%. The RN626X turned in very consistent scores between RAID levels for virtually all of the tests. Of the products included, only the ReadyNASes had eSATA ports. eSATA backups were ranged between 111.6 MB/s and 120.7 MB/s on the RN626X, and 97. MB/s to 111.6 MB/s on the RN716 depending on the file system being tested. USB 3.0 backup on both ReadyNAS NASes were well in excess of 100 MB/s. USB backup on the Thecus N7770-10G ranged from 35.2 MB/s to 41.0 MB/s. There really wasn't much of a difference between the USB 2.0 and the USB 3.0 attached storage results. The RN626X doesn't have USB 2.0 ports, but on the RN716X, USB 3.0 the performance on the backup tests were almost three times faster than corresponding USB 2.0 tests. The composite image below shows the detailed benchmark summaries for the three products being compared. Note: these results reflect only the testing with a single Gigabit connection. I'll cover 10 Gigabit performance in a separate section of the review. Turning to the NAS Ranker, if you sort for RAID5 class and Test method Revision 5, you'll discover that there are currently 36 NASes that meet that filter. It's worth noting again that the NAS ranker is based only on performance through a single Gigabit connection. Our #1 ranked NAS is still the ASUSTOR AS7004T, but the RN626X ties QNAP's TVS-471-i3-4G for the #2 slot. The QNAP NAS is a four-bay dual-core Intel Core i3 NAS that has two PCIe slots that could be used to add additional Gigabit or 10 Gigabit ports. Keep in mind that the Ranker does not take into account 10 GbE performance, so this is a fair ranking. Looking at the category summaries for Ranker Performance, you can see that the RN626X outperformed the other two NASes in every category except iSCSI where it was just barely edged out by the Thecus N7770-10G. As expected, the RN626X had high category rankings for Read, Mixed Read Write, Video (tied for #1 with the RN716X), backup and iSCSI. Removing the limitations of Gigabit Ethernet by using a 10 Gigabit Ethernet LAN connection, you can see performance that is otherwise masked. Looking at the chart below, you can see several problems. First, for RAID 0, File Copy Read for the RN626X was only 394 MB/s compared to 650 MB/s for RAID 0 File Copy Write. However, for RAID5, the results were reversed with File Copy Read at 669 MB/s vs. 345 MB/s for File Copy Write. Our published results represent the average of three test runs, so looking at the three tests provides some insight into the lower than expected benchmarks. Most products produce little variation from test run to run, but the RN626X showed high variation in many 10 GbE tests. The Excel results below show the three NASPT runs in column A, with averages in column L. The Windows File Copy tests are highlighted in columns L and M. Note the very high standard deviation for File Copy from NAS in the NASPT results. Standard deviation isn't calculated for Windows File Copy results, but you can see the variation. The RN716X showed very good NASPT File Copy From NAS for RAID 0 and RAID10, but only about half of the performance for the same test on RAID5. As expected, both of the Xeon-based ReadyNASes smoked the Thecus N7770-10G on the NASPT HD Playback & Record and the NASPT 4K HD Playback tests for all RAID levels. All three NASes turned in similar iSCSI write results, but the RN626X significantly outperformed the other two NASes for iSCSI Read. With this latest addition of the NETGEAR ReadyNAS 626X we now have ten NASes tested with a 10GbE connection if you include NASes with any number of drives. I've created separate charts for each RAID level (RAID 0, 5, and 10) that shows File Copy Write and File Copy Read results for all 10 GbE products. In the first chart we see the RN626X at the top of the charts for File Copy Write, but as noted above, its File Copy Read for RAID 0 was significantly lower. Looking at RAID 5 results, you can see that the ReadyNAS 626X is lower than the Thecus for write operations and below the QNAP TS-563-8G for read operations. Note the differences between the RN626X write and read results. Finally, looking at RAID 10 results, the RN626X again is at the top of the charts for File Copy Write but lags behind four other products for File Copy Read. Obviously, you pay a premium for the performance a 10 GbE-enabled NAS can provide. So you probably don't want to consider one unless you have the need and a plan for migrating your switch and client(s) to 10 GbE. Still, even without 10 GbE, the RN626X tied for #2 rank based solely on tests using the Gigabit ports. I found the variations in performance in read and write operations at various RAID levels for 10 Gigabit tests a bit concerning. But the RN626X is built on a solid platform and performance tweaks in the firmware could smooth out those variations.